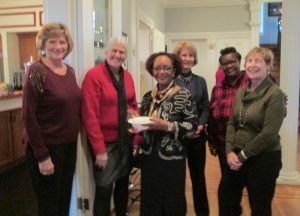 There was lots of delicious food and warm camaraderie at the LWVCC Holiday Gathering. Local attorney Bret Binder (law partner of LWCC President, Jennifer Levy-Tatum) graciously opened his historic, elegant, mansion home for the party. Jennifer’s homemade soup and a big pot of chili with cornbread (courtesy of secretary Valerie Thomas) were welcome on the chilly afternoon, as were the delicious pies made by new member Lorrie Maples and Pam Gray’s famous almond cookies, Christmas Cake provided by Susan Carty, sandwiches and fruit provided by Carole Mackrell and Sarah Caspar, topped off with hot coffee, provided by Alma Forsyth and refreshing punch, provided by Carol Kuniholm. We were delighted to welcome several friends, new members and potential members to the party and hope to see them all again in the new year. Report on Women’s March in Washington, D.C.